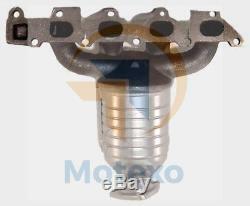 Exhaust Catalytic Converter OPEL ZAFIRA 1.8 Z1.8XE 9/2000 - / EURO 4. The real image should help you identify the part you need. Where available we use two images in the picture as it is the same product one picture from above and one picture from a side view for easy identification. In 1993, it became a legal requirement in the UK for vehicles to be fitted with Catalytic Converters as part of the Euro Emissions standards to improve air quality. Today, we supply direct from all the largest manufacture's in Europe's and supply the largest range of Catalytic Converters with our range covering. Alfa Romeo, Audi, Bedford, Bentley, BMW, Chevrolet, Chrysler, Citroen, Dacia, Daewoo, Daihatsu, Dodge, Ferrari, Fiat, Ford, Galloper, Honda, Hyundai, Innocenti, Isuzu, Iveco, Jaguar, Kia, Lada, Lancia, Land Rover, LDV, Lexus, Lotus, Mazda, Mercedes, MG, Mini, Mitsubishi, Morgan, Nissan, Peugeot, Porsche, Proton, Renault, Rover, Saab, Ssangyong, Seat, Skoda, Smart, Subaru, Suzuki, Toyota, TVR, Vauxhall/Opel, Volkswagen, Volvo. What are they and how do they work? A Catalytic Converter (Cat) is an emissions control device that reduces the level of harmful exhaust gasses that enter the atmosphere. It works by converting exhaust emissions into less harmful ones when the gasses pass through it, triggering a chemical reaction. EU Emissions Standards are subject to amendment from time to time, for example, vehicles made after March 2001 (Y-reg onward) are now required under UK law to be fitted with type-approved, homologated Cats. Anything from Euro 3 onward are classed as H-parts and can be identified in the BM range by a "H" suffix. BM Catalysts work tirelessly to keep up-to-date with these standards and develop our parts to meet the ever-changing needs of both the industry and our customers. Understanding Emissions Reports A vehicle will fail an emissions test on either, or all, of the following factors:Carbon Monoxide (CO) Levels Hydrocarbons (HC - unburned fuel) Lambda ReadingCO Failure can mean several things, but is most likely caused by a poorly running vehicle. If a Cat becomes contaminated with unburned fuel, it will become unable to effectively convert the gasses that pass through it. A new Cat at full capacity will almost certainly lead to a MOT pass, but unless the fault is rectified, the customer will return the next year complaining of the same problem. HC Failure is an indicator that the vehicle is over-fuelling. A vehicle will fail on this reading if it has HCs in excess of 200ppm. HCs in excess of 60ppm indicates a vehicle problem that needs rectifying as soon as possible. Lambda Failure means there is a problem with the air:fuel ratio on the vehicle. If the lambda reading is less than 0.97, the vehicle is running too rich. If the lambda reading is greater than 1.03, the vehicle is running too lean. Catalytic Converters fail for many reasons as mentioned above. In many cases, the failure has little to do with the Cat itself, but instead is the result of another fault within the vehicle. It is important to rectify any problems before a new Cat is fitted. When a vehicle fails an MOT emissions test, the blame is usually placed on the Cat. However, the Cat can only convert what gasses pass through it; if the vehicle is running poorly, the Cat will become contaminated with unburned fuels and become unable to convert the gasses efficiently. If the Cat is replaced without fixing the vehicle fault, it is highly likely it will pass the MOT test as the new Cat is working at its full capacity and will mask and fault. A tell-tale sign of a vehicle that has not been repaired is that they will return a year after failing the original MOT having failed the test again. The Engine Management Light will be triggered on the dashboard if the vehicle's emissions values fall outside the set parameters. The most common fault code relating to the Cat is the "Cat inefficient" code: P0420. It is important to investigate the following faults before condemning the Cat. Air leak in the exhaust system. Different Styles of Catalytic Converter Underfloor Cat This type of Cat is positioned directly on the underside (or underfloor) of the vehicle. Manifold or Close Coupled Cat These type of Cats are designed to fit directly on to the vehicle's manifold where the exhaust gases are hotter. This allows the Cat to reach optimum temperature more quickly and start the gas conversion process a lot faster Maniverter This Cat is part of the manifold and is consequently positioned where the exhaust gases are at their hottest. Again, this helps speed up the gas conversion process and helps the Cat avoid any unnecessary build-up of unburned fuels that could impact on the effectiveness of the part and could cause damage to it. Huge range of 103R compliant catalytic converters. Increase in efficiency due to higher loadings of precious metals. Unique approval number for each BM part number Our parts are Type Approved in order to conform to the current UK legislation laws which have been in force since August 2009. The law states that for vehicles registered on or after 1st March 2001, all replacement catalytic converters and CAT-DPF units must meet the set standards for emissions before they are granted with approval. Each part numbers carries a unique EC Approval number which is pin stamped onto the part. They are also denoted by the "H" suffix. The UK differs slightly from the European laws as all parts entering the EU market must be type approved (or Homologated as it is referred to). As such we offer approved parts for vehicles prior to the February 2001 deadline in order to also conform to the European regulations. The team at RSJ Exhausts is highly skilled, with many years of experience in the motor parts trade. We are a state of the art Internet based business and trade store that uses the vast knowledge of its employees to source the best deals for you possible. All our stock is supplied direct from the factory ensuring you get the latest developed product. The item "Exhaust Catalytic Converter OPEL ZAFIRA 1.8 Z1.8XE 9/2000 / EURO 4" is in sale since Friday, May 18, 2018. This item is in the category "Vehicle Parts & Accessories\Car Parts\Exhausts & Exhaust Parts\Catalytic Converters & Parts". The seller is "rsj-carcare" and is located in WV14 6AF. This item can be shipped worldwide.